As with many things in life, you have to learn to go with the flow, feel what’s in your heart and making changes accordingly. That is exactly what Barb and I did this week. First let me explain how the first two weeks of our new job went mapping remote BLM lands in Utah. As expected we saw some really beautiful and remote country. The low lands offer a unique beauty of sage, cattle, antelope, jack rabbits, snakes and wild horses. The high ground offers absolutely stunning views, rugged bone jarring terrain and mountain springs that are so clear that you could drink out of them. The unexpected……. How unbelievably tiring it is driving rough country in the jeep for 6-7 hours a day. We come home at the end of the day whooped! I don’t think we have stayed up past 9:00 since we started. A couple more rocks under the tires and we will be back on the trail! When Barb and I started our full-timing adventure we really did not have any plans of having a job, as a matter of fact we had never really talked about working. Our plans were to spend the summers in Canada and our winters traveling the states. But plans change…..over the past year we have met a lot of great people and heard about a lot of great seasonal jobs that we never knew were out there. Camp Hosts, Lighthouse Attendants, Gate Guards, there are literally hundreds of both paid and volunteer positions out there that are perfect for traveling couples. When we heard about this position from our friends Steve and Joan we thought it was too good to be true, getting paid to drive and explore remote backcountry roads and hanging out with good friends. It would be like getting paid to play! A herd of wild horses that would not get out of our way! Despite all the cool scenery at the second week we realized we just weren’t totally happy. Getting up at 6:00am, out the door by 7:30 back home by 5:00 totally whooped. I realize we won’t get a lot of sympathy from most of the readers but the thought of doing this 5 days a week for the next 16-20 weeks was daunting and to be honest it was affecting our relationship. Maybe we should have realized this going in but at the end of the 2nd week we decided it was time to reevaluate our plans and do what was right for us. It is a good job, good pay, working for and with some great people. So we sat down with our bosses Chuck and Claudia and explained our situation telling them we were going to move on and get back to our routine of life on the road. They totally understood and even took us out to dinner that night with the other teams! What a great couple and great company. In two weeks we met several couples who we know will be long time friends. If anyone is looking for an adventurous job where you get to see some really cool country while getting paid, send me a note and I will put you in touch with Chuck and Claudia. So what’s next? We are going to spend a few days with the kids then head west to the coast where we plan on seeing Barb’s 94 year old grandmother, stepmother and maybe a few other relatives if it works out. Then back east to see the kids one more time before heading north into Canada for the summer! Regardless, we had to get it fixed so we made an appointment with Camping World in Draper Utah, they were the only ones who were able to get it in and out in a couple days. I must say they did a great job, you cannot even notice it was ever there. During the few days the rig was in the shop we stayed at Jessica’s house. It was nice to spend some extended time with the kids and get some chores done. Speaking of chores, Barb and I both noticed something very disturbing about the same time when our jeans started getting a little tighter. We knew it could not have anything to do with the amount of food we have eaten here….. but what could it be? It had to be….Jessica’s washer and dryer, yeah that is it! It has been shrinking our clothes! Mystery solved we vowed not to wash our clothes there anytime soon and headed out to an all you can eat buffet. That weekend it was time to head to our new jobs which started Monday. If you recall, we will be using our Jeep and 4 wheeler to map gravel and two track roads in remote lands in Utah, Wyoming, Idaho and Montana. As luck has it, our first assignment is within an hour of Salt Lake! So we headed out to our new campground to meet our new coworkers (all very great people!). Our employer had told us that it is often a challenge to find a campground that could accommodate 6 or more rigs for weeks at a time with full hookups, good Wi-Fi service and gas stations close by yet be close to these remote lands we were to map….. The campground we are at is really more of a mobile park with a handful of RV sites. Certainly not the best area we have stayed in but it will serve the purpose. Looks like we will be here about 4 weeks before moving to our next area. If you have been watching the news the past couple days you probably heard about the nasty weather in the Salt Lake area. Yesterday it started to turn really nasty, first the wind….there were sustained winds 30-50mph and some areas were 70-80mph! They closed I-80 in one direction and closed the other direction to all high profile vehicles. The wind really picked up the dirt and the sky was filled with dust and dirt. An hour or so later it started to rain…. or should I say mud. The combination of the dust storm and the rain…… we have never seen it rain mud before! That night as it cooled down it turned to snow and we woke up to several inches of snow. Ugh! No work on snow days so it looks like a great day to catch up on the blog, watch a movie, relax and try to keep warm! An Eclipse, a Birthday and Easter make for a busy weekend! 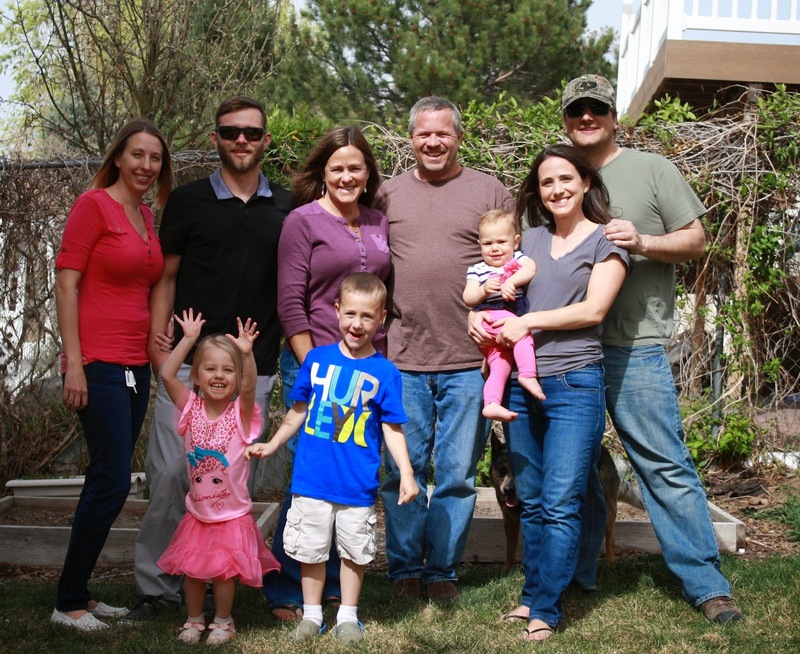 It was an action packed weekend with lots of family time! It all started Saturday morning with the Lunar Eclipse. 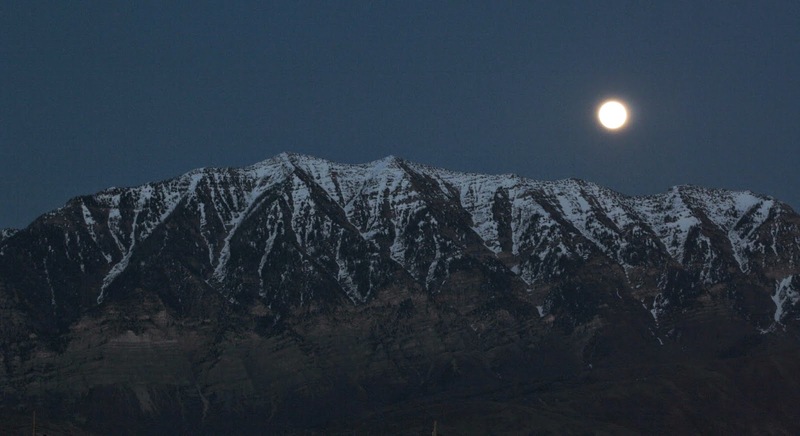 Over the past couple days, I had been noticing the moon the last couple evenings and how beautiful, bright and full rising over the Timpanogo range and setting over the hills across Utah Lake. Then, my brother Bob and I were talking about the lunar eclipse Friday evening and I decided that I was going to get some pictures of it. When he told me it was starting at ~5:30 CST, I was like…wait, what? That is 4:30 my time! But he was nice enough to volunteer to call me and wake me. That night I spent some time reading up on how to take pictures of the moon during an eclipse. There are many options on how to take pictures of the eclipse. Not only that, there are different settings for pre-eclipse, during and for the total eclipse itself. Battery charged, camera on tripod, memory card empty, I was ready! True to his word Bob called about 4:30 and woke me up (and Barb too!). Barb did not seem quite as excited as I was and opted to stay in bed and look at the pictures later. It was a heck of a lot colder than anticipated but I stuck it out and took about 300 pictures using different ISO’s fstop’s and shutter speeds. Even a blind squirrel finds a nut once in a while and I figured if I took enough pictures at various settings I would get at least one good picture! In the end I ended up with about 6 that I thought were really cool. Later that afternoon we headed to Jessica’s for Kendall’s first birthday! Kendall wanted all the attention on her so she only invited Dylan and Lily to her party. We had brats, potato salad and her specifically requested Dairy Queen cake. According to her dad her first words were “I want a Dairy Queen cake for my birthday” No one else was around to hear it and sadly he did not record it as they would have made millions on commercial endorsements had he recorded it! 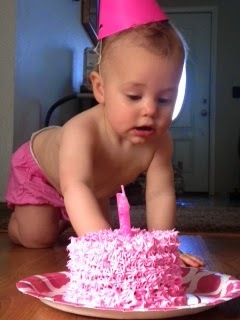 In addition to that cake, Jessica made Kendall her very own cake to play with which made for some great pictures. ....and her new cell phone! Sunday morning broke with the sun shining and the promise of another glorious day. Until Barb said….”Time to search for your Easter basket!” Oh, crap Easter! I replied with a smile….”Time for you to look for yours too honey” There are not too many places to hid a basket in a 400 sf trailer and I found mine in short order. Barb on the other hand is having a little more trouble finding hers. I think when this blog is posted and she reads this she might figure it out and stop looking. Hey, I guess we are now even for Valentine’s Day! That afternoon it was off to Jessica's again for more Easter fun! We had a Easter egg hunt then went out to dinner at a local barbeque place named The Sugar House BBQ Company it is probably the best place in town. Then back to Jess' for a little post dinner dessert. By the end of the day we were all whooped from the eating, drinking and kid activity. Kendall even found a couple! ﻿﻿We heard from our new employers the other day. It looks like we start on the 13th about an hour and a half outside of Salt Lake. In the meantime we are going to take a few days to get the rig fix (more on that next time), rotate and change the oil on the vehicles and get a new belt on the Ranger. We won't have time after that as we will be back to the daily grind working 40 hours a week!!!!!! It is only the 4th month of the year and I already have this award locked up. It all started yesterday when our daughter Jessica had the day off and we decided to head to the zoo with grandkids Dylan and Kendall for a day of fun. It was Wednesday after all and it would be nice and quite day at the zoo. Wrong! It was spring break at the local schools and the parking lot was absolutely packed. Getting inside was not any better, it was a maze of single, double and even quad strollers and that was only 1/3 of the kids in the zoo, the other 2/3 were screamers running around from exhibit to exhibit on a sugar high. Now anyone who knows me, knows how much I LOVE kids, it was a trait I think I inherited from my father and he from his father. A long generation of total tolerance with screaming kids. The more screaming and running around the happier I am. Not to mention the germ-fest that must be going on in that place! I had to take a sanitizer shower when I was done but I survived without having one melt down or hurting one kid! Thus, the Grandpa of the Year award! Look at all the screamers! Well, I guess my awards for the Father of the Year and for Husband of the Year may be a lost cause.....For my picture, Barb was looking for a Jackass but there was none to be found. So instead she found a turkey. As many of you may know, the turkey came in second to the eagle as our national bird. So she chose a bird that has a close personal connection to the majestic Bald Eagle.....I'll take it! All in all it was not a bad day at all. For day 3 of the black and white photo challenge I selected this panoramic shot taken at Saguaro National Park outside of Tucson Arizona. You really have to click on it and enlarge it to see all the detail of these giant wonders of the desert.